Every few years, I read a David Sedaris book to renew my love of short stories. 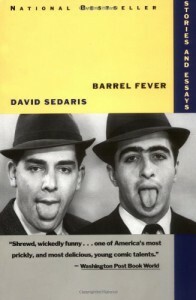 I love novels, but Sedaris's work reminds me not to overlook short stories and essays too.His humour is more heartbreaking than funny: for example, in the first story in this collection, "Parade", the narrator names several of his very famous ex-boyfriends, including Peter Jennings, Morley Safer, and Mike Tyson. Although it is hilarious to think of Sedaris dating Mike Tyson, it's also kind of sad, because in many ways the world would be more interesting if this story were at least possible. Well, at least in my head, David Sedaris (who, I know, is not the same as his fictional narrator) used to date Mike Tyson. Done!The other stories were darker and less playful, and there were no others that I thought would make for a better world if they were true. Still, I like the prose (although it's hard not to hear the words in Sedaris's voice if you have heard him on the radio), and would recommend this book.